If you liked this show, you should follow Piggy Bank Promotions. Great advice at start of a New Year: NO Money Marketing! Whether you're launching a small or one-person business in 2013, or re-evaluating your small business, Nancy Butler has the advice for you. Nancy is the owner of Above All Else, a business in CT where she teaches all sorts of businesses, including major corporations, how to improve their bottom line. And she succeeded by starting her first business with no money...and found the way to gain the kind of visibility Piggy Bank Promotions is all about. 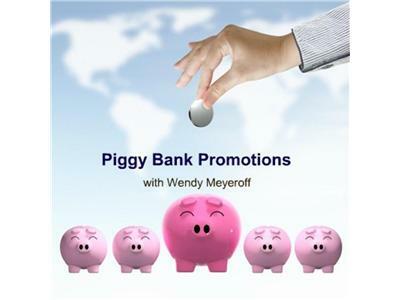 The 1/3/13 show's a repeat, while Wendy Meyeroff, the host of Piggy Bank Promotions and owner of WM Medical Communications is away, but trust you'll enjoy it. Feel free to send any questions to our Facebook page or see Piggybankpromotions.com.